of 20th century, also housed an altar. Under the arch there are fragmentary remains of frescoes: on top, you can see the figure of angel enclosed in a shield, on the right side a Saint with a book in her hands, while on the left there are still faint outline traces of a Saint. The figurative culture expressed by a few surviving elements is that of Robert d’Oderisio, major Southern interpreter of the lesson of Giotto in the early 14th century. of 20th century, also housed an altar. 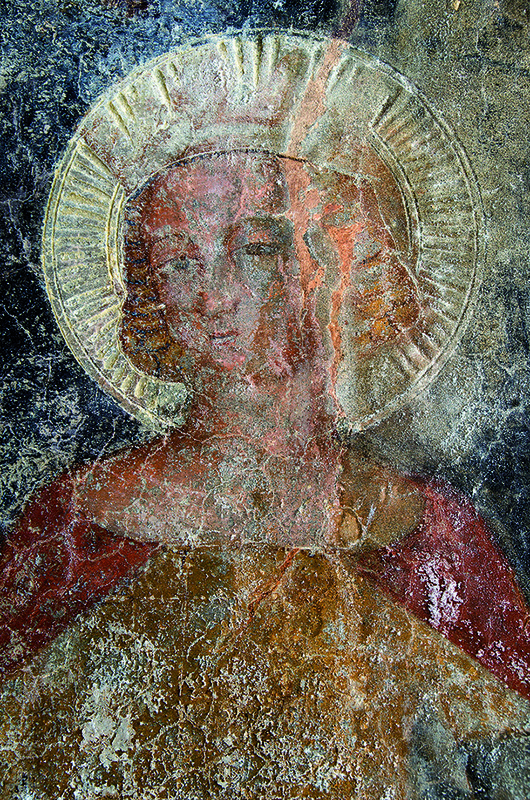 Under the arch there are fragmentary remains of frescoes: on top, you can see the figure of angel enclosed in a shield, on the right side a Saint with a book in her hands, while on the left there are still faint outline traces of a Saint. The figurative culture expressed by a few surviving elements is that of Robert d’Oderisio, major Southern interpreter of the lesson of Giotto in the early 14th century.